Well, you’re probably wondering where on earth “Beyond the Waterfall” is. Guess what? I had another delay! I have to clear it through my new workplace. It’s no big deal and I have no doubt it’ll pass, but since I’m brand new here, I want to play things by the book. You see, when I worked for Apple, if I released or worked on anything that could potentially conflict with Apple’s interests (apps, programs, systems, OSs, etc), that was a problem and they were (for the most part) the property of Apple. Blizzard does do books, you see. So I just need to clear it. Once that happens, you’ll see it going up on Amazon within a day or two. I’ll be honest though. I haven’t done much writing otherwise. I’ve been so wrapped up in all the epicness of my new job, it’s hard to take the time out to write. You see, many of my lunches are hanging out with friends, my family, playing some games and more. It’s great. Really. But it’s cut down on my writing time. And with Tali now teething and the addition of a new cat named Harmony to our household…things are complicated. But there is one thing I want to address. I’ve been subtle about what’s happened at Apple to Laura and I. That ends now. Laura was terminated from Apple last Saturday for “continuing attendance” problems. I posted about it on Facebook. And now I’ll do it here. Laura might want to be subtle about what happened to her today. But I am intensely protective of my wife and family. And I want everyone to know what happened. As you know, with Caitlyn and Tali, we made the decision not to do daycare. Partially for financial reasons and partly because we didn’t want strangers raise our child. Laura and my schedule were based around that. While the managementmade things difficult after I returned to work once I made Genius, it was something we could work through. Basically, she would bring the kids to work, I would take them home. While I was home with the kids, she was at work and vice versa. When I got my job at Blizzard, my schedule changed to a Monday-Friday shift. We knew this and made sure to tell the managers that Laura’s schedule would change a few weeks in advance. We offered a different schedule for her. The store manager refused. She refused any compromise whatsoever. She demanded that Laura give 3 days of full availability. In fact, when her superior, the market manager, made a suggestion to accept Laura’s offered schedule for a month, the store manager refused that too. I told the market manager that I didn’t want our relationship with Apple to end badly…but the store manager didn’t care about such things. But she wouldn’t just lay Laura off. She said that it was “her decision.” What that meant was either Laura quit or Laura calls out until she’s fired for attendance. Laura was left in limbo for over a month, constantly being forced to call out to take care of our children. Today, they finally dropped the axe. They terminated her violation for the attendance policy. The events surround Laura’s departure to care for her family and the events that preceded my departure from Apple Retail shows that this is far from true, at least in the store we worked at. This philosophy is dead. I hope that it’s real in other Apple Stores. I actually do. And I hope that one day, that Apple Store figures out what they’ve turned that place into. But by God’s grace, that is no longer our problem. Now you know the truth. I ask for your prayers, not only for us in figuring out what Laura’s going to do, but for the management at our former Apple Store. I mean it. I pray that they would realize what they’ve done and change their ways so that others don’t have to suffer through what we had to suffer through. And pray for those still there, that they might be spared or that they may find something better. So that’s it for today. I wanted you to know the truth about Apple and Waterfall. I think I’ll be kind and leave out the PMV for today. 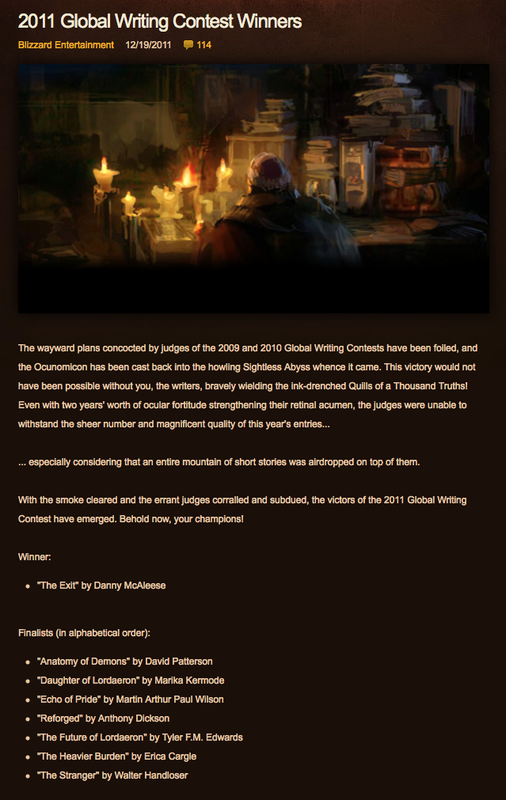 I’d submitted to the Blizzard Global Writing Contest in 2010, but hadn’t placed. Ironically, it was a poor review by a friend of mine which drove me to start doing personal journals daily. I just had to process the information somehow and it was the best option. It was the origin story of the Mage Dayshaun, who would eventually become Lyssinna. When the new Contest with live on August 15, 2011, I did my homework. I studied the previous winners and all the recently-released Leader Short Stories. Exhaustively. I read through the Grand Prize winners a few times. I realized that the winners of the contests had all taken known-characters and revealed hidden parts of the story that just hadn’t been addressed in books or the games themselves. So after taking some time, I finally landed on an idea of General Marcus Jonathan fighting to survive Deathwing’s attack on Stormwind. The story went through at least 30 revisions. I slaved away on this story for months. And just a few days before the deadline, Blizzard decides to come out with Varian Wrynn’s Leadership short story, which occurs a short time after Deathwing’s attack. I freaked…but found out that I only needed minor changes to make it work with my own story. I submitted it with about 18 minutes to spare and hoped for the best. The first part was no surprise. But just beyond that was a section that wasn’t listed in the WoWInsider.com article. What’s that there at the top? And there…to my shock…I saw my name at the top of the Honorable Mentions list. I just pointed, barely able to speak. My coworker immediately stormed out of the room and hauled the Store Manager back into the room and pointed. I couldn’t believe it. He laughed and clapped me on the shoulder. 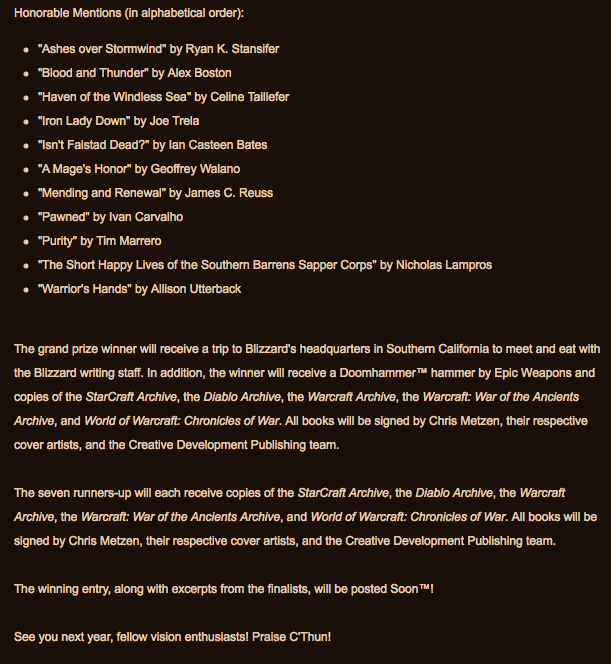 “Ashes over Stormwind” had won Honorable Mention! But it got even better. That night when Laura and I were celebrating at Olive Garden, I got an email from none other than Tommy Newcomer, an Associate Publishing Developer attached to Creative Development for Blizzard!. Salutations from Blizzard Entertainment, Ryan! If you haven’t already seen the blog posts on our websites, YOU received an honorable mention in the 2011 Global Writing Contest with your entry, “Ashes over Stormwind”! You may now commence the bacchanalia (if it wasn’t already under way). We really enjoyed your portrayal of Marcus Jonathan, and while many stories this year dealt with the chaos in Stormwind during Deathwing’s attack, yours was easily the most vivid re-creation of the event. We look forward to seeing what you come up with for next year’s global writing contest! Congratulations, once again, and feel free to keep in touch if you have any questions or concerns! I was beyond shocked and beyond overjoyed. Not only was it one of the greatest moments of my life, but I had always struggled with an absolutely vicious internal critic for my writing, always telling me that my writing was horrible and that no one was being truthful enough to say it. Well, now I had absolute and irrefutable proof that I was a damn good writer. To this day, this event has permanently shut up that little voice. But even better? 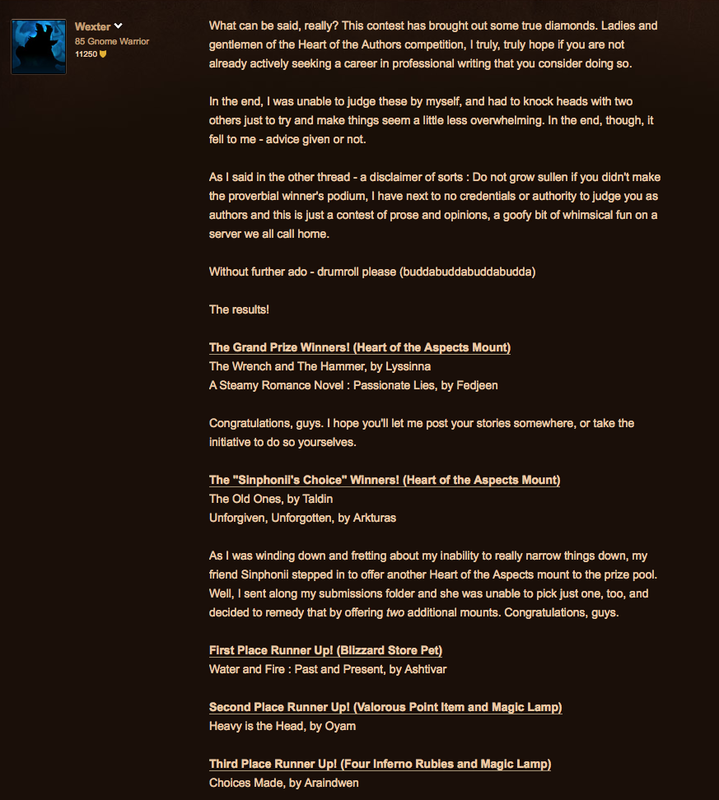 In February of 2012, I found out that the Wyrmrest Accord forums was doing a community writing contest. I decided to enter this (though I can’t quite remember if this was before or after I found out about the Honorable Mention. I think after). I remember writing this story in about a week, but I still worked my tail off. I actually created an English to Dwarvish dictionary by studying the Dwarvish accents in “The Shattering” to make sure the accents were correct. And my hard work paid off. Congratulations! It was such a hard decision to make, but I can say with all my honesty that you were above and beyond the most deserving recipient of a grand prize! Myself, Thokk, and Sinphonii all found ourselves in agreement on this, it couldn’t have gone any other way! So huzzah! Hooray! Your talent with the written art has won you a Heart of the Aspects mount! Please get back to me and we’ll iron out the details of your prize! That’s right, I was Grand Prize Winner. Several people in the forums said that mine was voted for top at 110%. It was fantastic. Now, since I worked at the Genius Bar, I had the opportunity to meet thousands of people every month. I didn’t often get Blizzard employees, but I definitely did make sure to ask questions for those who I did. I made two major contacts, a couple expecting their first child who gave me a ton of advice on how to apply and what to put in the resume, and a second who we actually became friends with for a while. Sadly, the second, who had a very unique position within Blizzard, was laid off during February of 2012. It was too bad, because they were great people. Laura, Caitlyn and I even had dinner with them at one point and they were kind enough to give me a copy of the Diablo 3 “Book of Cain.” They were good people. The other sad part was that the man behind the Blizzard Global Writing Contest was also let go, making 2011 the last year for the contest. But at least I managed to get my name on Blizzard’s website before that ended. I’m going to stop here because I want to end things on a really high note. This was one of the greatest periods of my life. Things get a lot rougher after this. A whole lot rougher. But that’s okay, because we know how at least that part ends. Tomorrow, I’ll release Part IV where we approach current events. Stay tuned! This is from a text message my wife just sent me. It’s a reminder that God’s plan doesn’t work on our time table. And just because it’s not happening when we want doesn’t mean that it won’t happen at all. It’s a good reminder. Especially for me. Especially now. I’m sorry about last week. I completely spaced on doing this on Easter. That and considering my “Cryptic Thing” occurred on the Friday before…well, I had a lot going on. At the moment, I’m still inside what I’ve come to call “The Third Gate” (borrowed from Ready Player One by Ernest Cline, which is fantastic. Go read it. As soon as your done reading this). I entered the Third Gate on Friday, the last step in my “Cryptic Thing.” It’s been a week and I haven’t heard anything. That’s okay. Especially considering the paragraph above. But still, this has been one of the hardest and nerve-wracking weeks of my life. So I still need prayers. A lot of them. That I would succeed in the Third Gate. Where I would be able to pass through it victorious. I’m praying at least four times a day about it. I don’t think I’ve ever wanted anything so bad in my life. Well…that’s not entirely true. You see, if I get this…if I succeed in the Third Gate…it will be the third greatest miracle in my life. The first is finding a wife who somehow puts up with me. The second is having two beautiful healthy baby girls (even if they are a pain in the rear occasionally). This would be the third. And I want it. Badly. So please pray for me. Pray that I would not lose my mind in the waiting. And pray for my success in this…even if it’s just so I stop being so darn cryptic about the whole thing! Some interesting things have happened in the last few weeks for the Inklings. We’ve done very well and added two new members to the critique group. Totally thrilled about that. Seriously. There also have been rumblings of change. Some people are discontent with how some things are going. The most encouraging part though is that all of them have been praising me for my leadership of the group. That means a lot. I know that a critique group is a hard thing and I know that my job is part organizer, part cheerleader. I have to keep spirits high, otherwise the thing will fall apart. And so far, it’s going well. The Cryptic Thing is now entirely out of my hands. It’s wholly in God’s hands. I can’t do a thing about it. So that leaves me with needing something to do…and in truth, I’ve been neglecting my writing. My imagination has been howling for a while now. And I’ve decided what I’m going to do next. It was influenced a lot by the Inklings, where I realized that my stories weren’t up to snuff to submit to the group. The first thing they ever saw was my most polished piece of prose I’ve ever written. It was editing like 20 times. Probably close to publishable. And while I don’t want that for everything, I don’t want to throw the critiques with oddities like strange spacing, formatting, spelling and grammar and obvious plot holes. So…I’ve decided to head back to Stormhaven. Drat. I had this really cool cast photo I wanted to post here, but I can’t seem to find it. Mhr. Anyway, Stormhaven was originally inspired by “The Wotch” and “El Goonish Shive.” In fact, it was going to be a webcomic done by Laura and I. I would be the author, she would be artist. It’s a spinoff on some of my other stories I’ve posted in other places too (and yes, I’m being vague on purpose). In some ways, it’s the reverse of the Harry Potter series. A kid raised in magical society is thrown out and forced to learn to live with the rest of the human race. I had started rewriting it last year, but ended up shelving the project for another Taylin story shortly before NaNoWriMo. And at the moment, “What Lies Beyond Steam and Magic” needs to sit on the virtual shelf for a bit. I need to give myself a break. That’s it for now folks. Wow, a writing post in my writing blog. Shocking! Just please send me your continued prayers about the Third Gate…that I would be successful. But you know what? We haven’t done a PMV in a while. So I found a new high-energy one I REALLY liked. So enjoy! So this has been an eventful week for me. Work things have occurred. Things that are forcing me to move forward with plans, no matter if I like it or not. One day, I will speak of these things openly. But not today. As of today, it’s still time to just say that things outside of my control have begun…and now I must stay ahead of them. In addition, I took the time today at lunch to use the program “Aeon Timeline” to plot out the existing timeline of “Steam and Magic.” Why is this important? Because it’s been driving me crazy on the length of time it will take for the Rose to reach one point from another. And now that I have that planned and plotted, I finally got to look and realize where I needed plot points to happen and how they could fit together. I finally have a few things to write. I’ve been stuck in this forever. At the moment, I’m still waiting for my very busy friend to get a free moment to finish the critiques on “Beyond the Waterfall.” I promised not to publish until she was done. And since she’s so busy with her own work, it might be a bit until that sees the light of day. Just be patient. It’s coming, I promise. Oh yes, I’ll try and avoid any spoilers. I’ll start with the official synopsis, taken from Sanderson’s website. It has been centuries since the fall of the ten consecrated orders known as the Knights Radiant, but their Shardblades and Shardplate remain: mystical swords and suits of armor that transform ordinary men into near-invincible warriors. Men trade kingdoms for Shardblades. Wars are fought for them, and won by them. One such war rages on a ruined landscape called the Shattered Plains. There, Kaladin, who traded his medical apprenticeship for a spear, has been reduced to slavery. In a war that makes no sense, where ten armies fight separately against a single foe, he struggles to save his men and to fathom the leaders who consider them expendable. Brightlord Dalinar Kholin commands one of those other armies. Like his brother, the late king, he is fascinated by an ancient text called The Way of Kings. Troubled by overpowering visions of ancient times and the Knights Radiant, he has begun to doubt his own sanity. Across the ocean, an untried young woman named Shallan seeks to train under the eminent scholar and notorious heretic Jasnah Kholin, Dalinar’s niece. Though she genuinely loves learning, Shallan’s motives are less than pure. As she plans a daring theft, her research for Jasnah hints at secrets of the Knights Radiant and the true cause of the war. The result of more than ten years of planning, writing, and worldbuilding, The Way of Kings is but the opening movement of the Stormlight Archive, a bold masterpiece in the making. I should mention that I listened to this through Audible.com, which is my go to source for all Audiobooks. It was narrated by Kate Reading and Michael Kramer. Let’s start with them. I’ve listened to these two before, since they were the two who did the “Wheel of Time” series…and they drove me batty. But I started to realize my problem was so much with the narrative, but the books as well. I had been used to the narrator for the Discworld series, Stephen Briggs and Nigel Planer (Planer is just freaking AMAZING). These two readers were powerful, entertaining and just slightly crazy. However, Reading and Kramer are much more subtle. They’re a bit monotone. They don’t really get passionate in their readings. Don’t get me wrong, they’re total professionals, but it can come across as dull. However, it’s more about the book, right? Way of Kings takes a long time to get moving. And it’s huge at 45 hours for the Audiobook version. It’s very slow going at the beginning and it’s frankly not until the end where the three main character threads intertwine. However, the sheer richness of this world is almost overwhelming. I can’t handle it all. Even after reading the entire first book, I get the feeling that I’ve only seen a corner of the world, a tiny sliver of an enormous boulder. Sanderson has world-built this place better than anything I’ve ever seen. It’s astounding. And the characters? Amazing. Simply amazing. You really get in connection with these characters. What drives them, what they hate, what they love and what they dream. I don’t think I’ve read any of his stories where characters have been so richly defined. The magic system is also very interesting, but instead of revealing most of it like he does in his other books, Sanderson takes his time. You get the feeling he’s only touched the surface as to what the magic system can do…and what’s really powering it. In the end, you’re left with more questions than answers. The finale is simply EPIC. Sanderson is well known for his spectacular fight scenes and this one does not disappoint. We have a full scale WAR going on here at the end of the story. But the true shockers are the brief one-perspectrive chapters at the end. The final revelation at the end of the book? That twist will probably pop your head right off. I’m still reeling from it days afterward. In the end, this is Sanderson writ large. While it takes a good long while to get going, it’s worth the wait. It doesn’t grab you quite as powerfully as the others, but by the time you reach the end, you’ll find yourself unable to stop. It’s a great ride. And I’m looking forward to the next book which I just might read next. You definitely need to check it out. Okay, I’ve had friends recommend this to me before, but I was in the middle of Way of Kings at the time and got away from audiobooks for a while. Once I finished Way of Kings, this was the next book on my list. And I think I finished the audiobook version, all 15 hours of it, in three days. In fact, I was listening to it with Tali most of the time. Every commute that I could (save for those with Caitlyn, because she could repeat some of those words…and the main characters tend to enjoy their colorful language), too. Let me first get one thing out of the way: there are plenty of infodumps in this book. Especially when you’re listening to the Audible version of it. Sometimes they can be so long that you forget the events the characters were going through. However, I was willing to forgive it because the backstory on the world, the OASIS and the characters was so damn interesting. I kept losing myself within these miniature stories-within-a-story. It was somewhat jarring to come back out of them, but the flow was good enough that it pulled you right back into the main story. (So imagine if Lost had actually told a story well…, but I digress). While I’m not the greatest fan of Wil Wheaton’s narration (I don’t feel he does that great with different voices or accents), this story was just amazing. I love all the nostalgia. While I’m about five years too young to enjoy all of the references, I do remember the Colossal Cave Adventure. I played Joust on the Atari (when most kids were playing with Nintendo…my parents didn’t exactly help my gaming career save for some PC games). I remember the tales of Dungeons and Dragons, though sadly I’ve never actually played a game (something I still regret to this day). This book is a celebration of some of the most iconic pop culture that still defines our era. But the best part to me was the relationships and the revelations. More than anything I wanted to see the answer to the “will they/won’t they.” I love seeing these people who are unabashed shut ins and social pariahs building real relationships that move past the borders of fantasy and into reality. They become real people even as they fight for a virtual reality. And I think that’s the greatest accomplishment of this book. The OASIS currently has a present-day counterpart. Second Life. You could also argue that it also lives on in Everquest, SW:ToR, WoW and all the other MMORPGs. I know how addicting being someone else can be. I was insanely addicted to Second Life…so much so that it almost wrecked my real life in ways that are a bit too personal to discuss on a public blog. Needless to say, I made a vow to myself and my wife that I would never enter Linden Lab’s game ever again. The temptation is just too strong. And that might be the reason this book resonates with me so very much. I’ve been in the main character’s shoes. I’ve created new personas online and metaphorically passed through the screen, becoming this other person. It happened before I was married and sadly, a few times afterwards too. And I think that’s why I loved this book so much. Because of the ending. Because we all have villains in our lives we would love to fight using giant mechs, plasma rifles and elven swords. They might not be the world-crushing baddie, but we all have bullies and jerks around us that we wish we could challenge to single combat. And in the end, we all want to be heroes of our own lives. This book has that in spades. Good characters, great references, fantastic action. This is a required read for anyone who grew up in the 80s and 90s…and doesn’t mind playing the occasional game. 😉 A must buy. Well, this is already at 2138 words. Way longer than my last few posts put together. But I was super-passionate about these two books, especially “Ready Player One.” I admit I’m sad that I don’t get to listen to Wil’s voice anymore for the story. I’m sorta hoping we might get a sequel someday. Maybe, maybe not. No matter, it’s still a damn fine book. Both are. I don’t have a PMV for you today. I regret to inform you that my favorite MLP fan-animation studio “Jan Animations” got hit with a Cease and Desist order a few days ago due to trademark issues. It’s a long story and there’s someone who’s already talked about it far more effectively than I can. I’m hoping Jan and Hasbro can work out some sort of deal…but I’m also glad I saved all of his amazing videos to my computer. So tonight, I will just wish you good luck and have fun. Work’s been hard the last few days. Can’t really give specifics. I rambled on for a while about it while being all vague, but it just was a jumble of nonsense. I got so annoyed, I decided to restart this post. Yeah, I got that annoyed with the ramble. So let’s talk about what’s going on other than work, shall we? The Michael Morones story has gotten pretty big, huh? You’ve probably seen it in mainstream media. Can I just say that I’m proud to be part of the “first responders” group for this poor child? And I’m proud of my community for it. The Bronies are awesome. I’m no longer a closet Brony in the slightest and this was the event that changed it for me. Please, take a moment to consider donating if you haven’t. I’m letting “Beyond the Waterfall” sit for a time. A friend of mine who’s a professional editor is taking a look at it and I don’t really want to move forward until I see her thoughts. I’ve never had a full professional edit, though. I’m a bit scared, but I know this is part of the experience in being an author. Soon, I plan to go back in there and fix the issues with the critiques and such. “What Lies Beyond Steam and Magic,” the latest novel in the “Crafters of Taylin” series cracked 100,000 words this week. In fact, I had a great whirlwind sprint of 3492 words the other day. That was awesome…and was totally thrilling too. I haven’t had a surge like that in what feels like months. Just the story flowing through my fingertips as if it was already written and all I was doing was copying it from the manuscript in my head. It was wonderful. I recently finished an ebook called “21 Reasons You Think You Don’t Have Time to Write” which was recommended through my favorite writing podcast “Writing Excuses.” It’s nice and short. And it’s ironically targeted directly at writing parents, which seemed pretty effective. Not quite the age of Caitlyn and Talissa, but still good nonetheless. And there’s one important thing that I forgot: you rarely get a full 2 hour stretch. It’s much more common to get 20 minutes here and there. But that’s still time to use as writing. You can still do it. I remember that I won NaNoWriMo three years doing my writing primarily on my 50 minute lunch and 2 15 minute breaks. I’ll admit right now that I’m struggling. I’m struggling with my new purpose of family and writing. You see, I do suffer from depression. Writing helps most of the time…and helping others helps too. But I have a lot of trouble keeping those good thoughts in my head. My emotions tend to be extremely overpowering, to the point where I can’t think about anything else. I’m struggling with my writing…especially with both Laura and I at work. If one girl is asleep, the other is awake and needs attention. I find little time to myself…for writing or for simply recharging. I’ve thought about cutting out video games from my life for a time…but I suspect that would be a bad idea. Gaming is one of my true releases. I can really lose myself in them. But I do need to stop gaming for hours on end and writing for only 30 minutes. That just needs to stop. The road before me is going to be a hard one. And I don’t think I realized how hard until today. At the moment, I’m trying to focus on the joy I can get in the moments I can. It’s hard work. Very hard work. My Little Pony is helping. As is the cooing smiles of Talissa and the squeezy hugs of Caitlyn. Even Laura is somehow giving me comfort even after battling the two girls all day. So I’m focusing on what Michael would have wanted instead. Otherwise…it would likely destroy me. This is probably one of my more…rambling posts, eh? So let’s just call it for the night. Hopefully tomorrow will be better. And hopefully good things will be happening and I can talk about them next week. So let’s finish with my favorite way to finish: a Pony Music Video. This one is freaking awesome. Seriously…the effects are utterly amazing. The sheer genius of this community never ceases to amaze me. Good luck and have fun everyone. I’m not sure which statement is more appropriate for tonight. You’re right. It’s probably both. Tomorrow, I return to my normal job as a Genius for Apple Retail. I’m sure the coming week will involve a great deal of training and certification on newer products, getting used to getting into the swing of things and other minutiae of returning to work after an extended absence. But what’s more important than any of that is how I approach it from here on out. As I said last week, writing is my new focus. I’ve learned a lot in the last few months at home, though likely not as much as I should have. I’m sure I spent too much time playing games and too little time playing with my girls or working on my stories. While my ADHD can take some of the blame for that (along with the panic attacks), in the end, it’s a choice. And in the last few days, I’ve chosen family and writing above anything else. There is nothing in the world more important to me than my family. I will do anything to protect them and provide for them. And the second greatest joy in my life is seeing someone connect with something I have written. To see an emotional resonance between the reader and the work I created. In truth, that is the heart of “The Crafters of Taylin.” It brings that resonance to another level…to a magical level. I think that joy is shared by any creator. Sadly, that joy can be fleeting. The explosion of warmth can fade very quickly, like a spark in a dark room. And then you get distracted by the other things in the dark and find yourself forgetting the spark of creation. The spark of passion. The spark of giving a tiny piece of your soul to the world. I’m sorry, I’m in a strange mood tonight. The truth of the matter is, I’m a little afraid. I’ve started some great things while on leave from Apple. I started “What Lies Beyond Magic and Steam,” the most ambitious “Crafters of Taylin” book yet. I started the OC Inklings online critique group to great success. 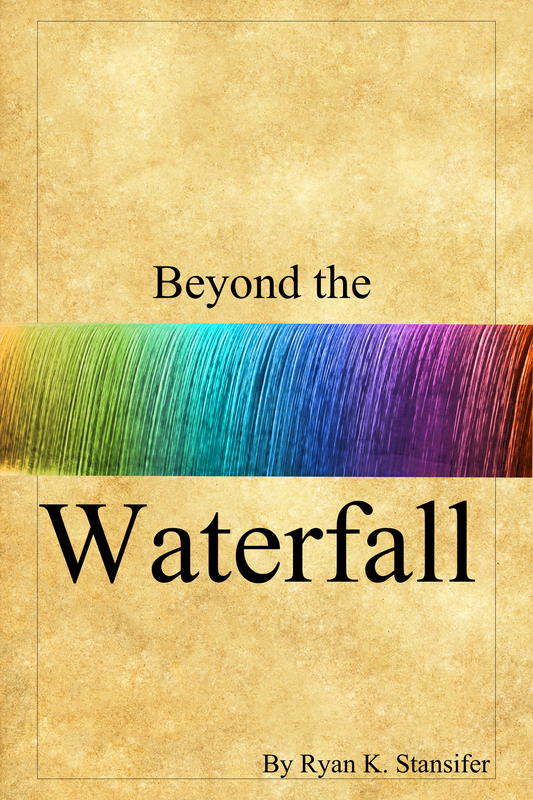 I’m about to publish my second short story on Kindle with “Beyond the Waterfall.” And then…there’s the whole new baby thing. Kinda a big deal, that. I know in my heart that it’s imperative I don’t lose the passion to see that spark. When I suddenly have to add a 40 hour work week to the rest of my life…it’s going to be hard. It’s going to be hard to think about writing after a long day of work and an even longer drive home. It’ll probably cut severely into my gaming time. And I’ll often make hard choices about spending time with family or spending time writing. But I know that my eyes need to be set on those two things which are the most important to me: my family and my writing. I don’t know if you all are the praying type, but I would ask for your prayers in this and the weeks to come. At the beginning, I’m sure I’ll be quite gung-ho about it. But as time passes…I can’t let the drudgery of daily life take that passion from me. Somehow, I have to juggle this. Somehow, I know that it’s imperative that I pull this off. The bad news? I won’t be making my deadline of tonight. The good news? I’m probably within a week or so of publishing it up to Kindle. I’ve got a good feeling about the story and the cover art seems to have gotten a lot of positive reviews from Facebook, which is one of the ways I help decide which one to go with. I have a horrible tendency to create variant upon variant. I could spent weeks on a cover if I wasn’t careful. Don’t worry, the moment the story goes live on Kindle, I’ll fire off a quick post with a link. I will almost certainly be charging $2.99 for this story, as it is 10K (28 pages for paperback, 46 printed pages). I’m really excited for this one. It was originally my entry into the OC Writers Anthology (which will eventually come out, so I’m told), but it ran way too long and I knew there was no way to trim it down to fit the goal. But I always knew something was special about this. You see, I wrote this story as I was getting into the world of My Little Pony: Friendship is Magic. (Don’t tune out yet, this one’s important). And I wanted to capture something…I wanted to capture my fear of disapproval. That nagging, horrible fear that tells you you’re not allowed to enjoy something because it’s “childish” or “wrong” or “what would others think?” To be honest, I’ve missed a lot of good things because I’ve let that stupid fear win out. I think I’ve spoken about this before, but that’s the reason I threw myself into the fandom of My Little Pony and why I was (and still am) so vocal about being a fan. It’s my own personal battle against that fear, because living in fear of the disapproval of “others” as a general entity is just plain stupid. So there, now you have a little history about what this story is about. I might add that in the afterword in the story. Maybe not. I’m not sure. 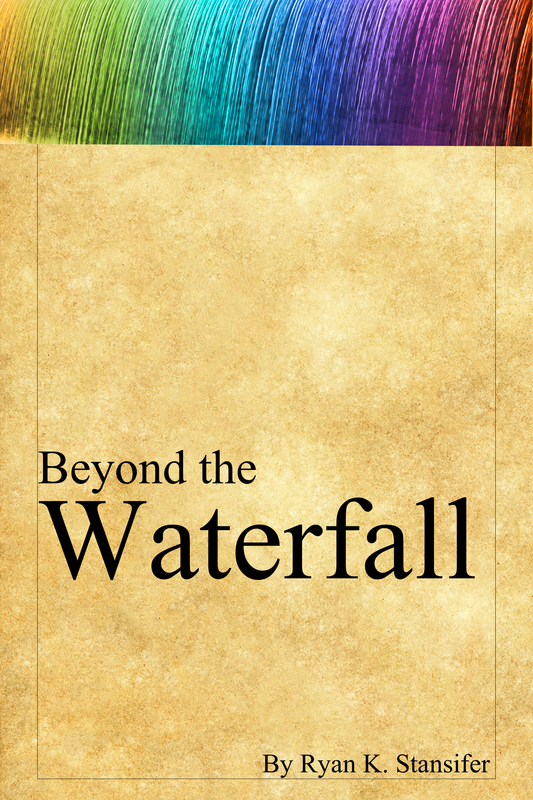 However, I do want to let you see some of the mockups I’ve done for the cover of “Beyond the Waterfall.” Now, I’ve already narrowed down my options, but if any of you have thoughts, I’d love to hear them. Just thought you’d be interested in seeing the experimentation process. I’m likely going to go with something similar to the first one. I feel like I should be putting something profound here. Something about always striving forward. Heh. Well, there is a quote that works fairly well for my final thoughts before I return to work. It’s a quote that I do love and I’ve probably put in here before. But it works. And in the end, a writer usually tries to do what works. And now, so we don’t end on a completely serious note…you know what’s coming next, right? I highly recommend you check out “Don’t Mine at Night” before watching this. Because it’s freaking hysterical. Okay folks! Good luck and have fun! I’ll see you next Sunday. This blog is sort of my public journal of sorts. I honestly don’t know how many people actually read it. I know some read it by email subscription and a very small few actually come to the main page. I just added Google+ and LinkedIn, but I don’t know if that’s really going to matter or not. I’ve shared a lot of thoughts on this blog since I became serious about it. A lot of thoughts on writing, my progress, gaming, Caitlyn, Talissa and a lot of other things. But in the end, -rks is a writing blog. It’s about my journey to becoming a full-fledged author. To becoming a published author. One day, I hope someone will be interested enough to go into the archives and read posts like these to find out how I made it as an author. Why am I doing this blog? Sometimes, I don’t really know. Part of it is that I know I’m supposed to. I’m supposed to do a blog. That’s what authors do these days. I know most of the time I’m talking to myself. But somehow, I’m okay with that. I’m one of those people who tend to figure out things as I write them. It’s one of the ways I think. So if I ramble, it’s probably because I’m trying to work something out. Part of it is because I hope that I might somehow find a community out there where I fit in. Part of it is because I can. Because in about a week, my Baby Bonding Time will be at an end. And that means my time at home is at an end. I haven’t worked at Apple since the middle of September due to my panic attacks and the birth of Talissa. Very soon, I’ll be going back. I’ve been thinking a bit about what that means. About what that means for my daily writing goals. About what that means for the OC Inklings Critique Group. About what that means for me as a person. About what that means for my future. The conclusion is one that I’ve already come to, but somehow it seems different now. 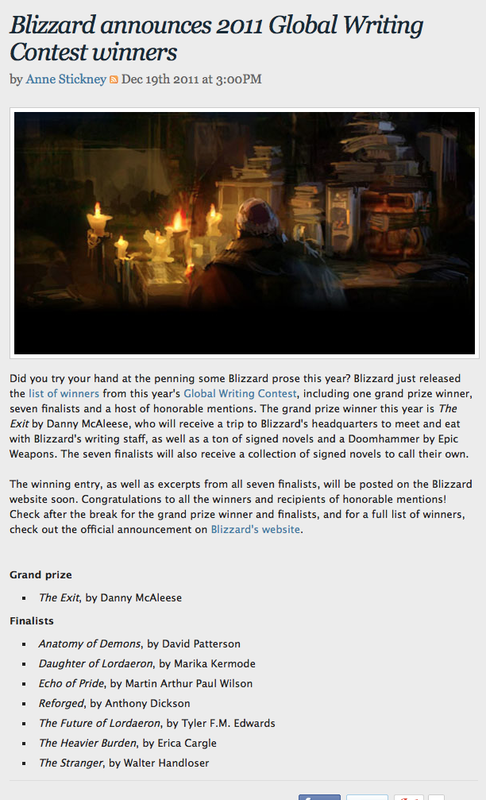 In 2011, I won Honorable Mention in the Blizzard Global Writing contest, the last one they ever did (the person who spearheaded it was laid off during that Winter, sadly). For me, that was the proof I needed that I could write. And I could write pretty damn well. Enough that out of the thousands or maybe even tens of thousands of entries, mine warranted a “Honorable Mention.” That I could take characters who were not my own and create a believable story enough for the people who originally crafted the world…that was a major milestone in my writing life. Since that event, the little voice in my head telling me that I can’t write has had no power over me. Because I had the proof that I can do this. In the last three months, I’ve learned a lot about writing. I’ve learned a lot about networking and that “Ashes over Stormwind” was not a fluke. “Beyond the Waterfall,” the first story submitted to the OC Inklings, was 9,000 words. The assigned goal for critiquing was 3,000. Nearly everyone burned past the 3,000 mark and just finished the story. They were so interested in the events of this short story that they read their required reading twice over. The results? Overwhelming positive. 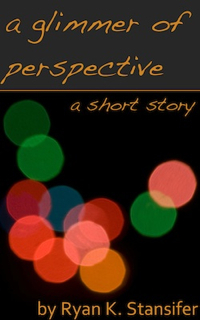 Reviews on “A Glimmer of Perspective?” Overwhelmingly positive. Comments regarding “Soul of the Scribe?” Overwhelmingly positive. A while back, I decided I wanted to be an author for real and I wrote an extensive post on it. As I head back to my normal day job, I’m realizing that’s exactly what it is: a normal day job. A vast majority of authors have to hold down the standard day job to make ends meet as they worked on their craft. And as I go back to Apple, that is my new mindset. I will do my job to the best of my ability. I will search for ways to push myself and learn all I can. Because places like Apple are ripe for stories. Not necessarily because of the events that happen, but in watching the way people interact with and react to one another. Coworkers, customers, managers, kids, regionals, Geniuses, salespeople…I can learn from this place and it can make my craft better. What I believe my greatest story, “Soul of the Scribe” which spawned the “Crafters of Taylin” universe with 5 books and over 300,000 words (or more) started while I was sitting in my car on my lunch break on a hot summer’s day, staring at the screen because I was bored with the story I’d been working on and wanted something new. So I started with that. An author with writer’s block on a hot day. That became what I believe to be my masterpiece. My passion is for writing. And one day, I hope to pursue that passion full-time. But until then, I must remember that the environments around me are what show me human interactions, which is almost always at the core of any good story. So what does this all mean? It sounds all really fancy and hypothetical and theoretical and a lot of other -reticals. Well, Saddleback Church is going through a series called Transformed. Heh, ironic, considering what I write, right? (Pun mildly intended there). And the lesson today was about goals. Pastor Rick Warren said that the difference between a Dream and a Goal is a Goal is a Dream with a Deadline. So what’s my Dreams with Deadlines? 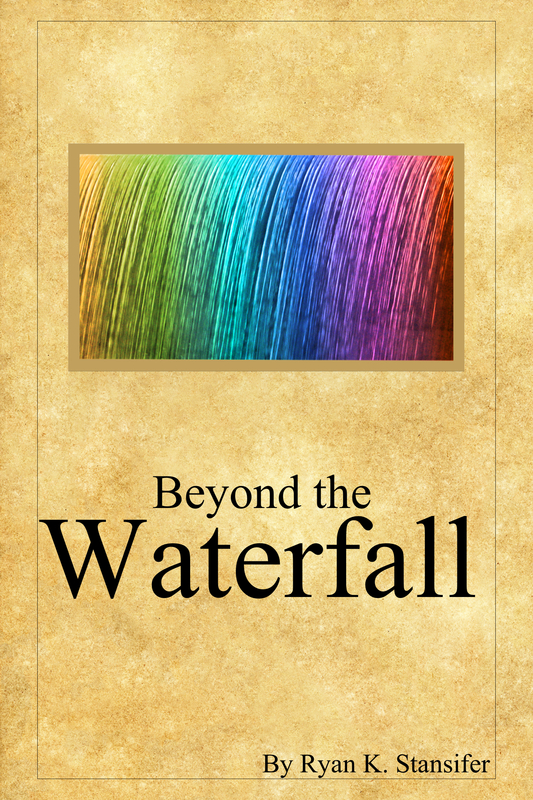 By January 27, 2014, I will have “Beyond the Waterfall” ready to go up on Kindle. By June 1, 2014, I will have at least one novel ready to shop to traditional publishers. By October 1, 2014, I will have a second novel ready to shop to traditional publishers. Every week, I will continue running the OC Inklings Critique Group. And by 2019, five years from now, I will be making enough income from my published works to pursue writing full time. There are many who might say a few of these goals are impossible or absurd. Way too high. Especially the last one. I’ve got to be crazy right? Well, part of the whole goal this is that it stretches your faith. I can’t do this alone. I don’t have the self-discipline, I don’t have the self-control. I need God to help me…and I need writing friends to help me. If anyone would like to be a writing buddy of mine and you’ve actually gotten this far, please let me know. I’ll tell you about my ideas. But the true challenge? Tomorrow morning. It’s easy to make big plans in blogs. It’s easy to do big promises. And then I need to actually do the editing I need to do. It’s hard. I hate editing. But it has to be done. It has to go through that process. I need to do that work. Which is why I’ll spend some time tonight working on my critiques for “Beyond the Waterfall” after I’ve done my personal journal. By the way, did you know I write 2000 words a day in my current work and another 1500-2000 words a day in my journal? 4,000 words a day. That’s pretty cool. Psychotic. But cool. I could mention other stuff, like my complete and total obliteration of the English Empire in Civilization V and the joys of seeing my invasion fleet crossing the ocean between our continents. About sending their navy to the bottom of the ocean and watching their cities fall in quick succession and enjoying wielding my insane amount of power across the globe, to the point where I send frigates wandering icy straits to take out marauding bands of pirates just for something to do. Or the joy I got in playing “The Journeyman Project: Pegasus Prime” this week, in revisiting a very old and dear friend who looks damn good even after 15 years. Or the photo shoot we did yesterday in Irvine Park which I hope to post pictures of soon. Or the fact that we got Tali to take the bottle fully yesterday. But today, today is about the writing. So the rest of that can wait for another time. However, I will add a Pony Video. Because it would be weird if I didn’t, right? This one you probably won’t get unless you’ve actually seen the episode it’s referring to, but still. It’s awesome.